Did you know that at an average Indian Railways sells close to 21 million tickets daily? Almost 250 million tickets are booked via IRCTC annually. At 8:00am when the booking window opens thousands of people are waiting to get their tickets booked both online as well as at the railway reservation counters. Tickets which are booked directly at the Railway counters are done through a separate system which is directly connected to the back-end infrastructure, which is very different therefore the counters don’t face the challenges which the online users have to deal with. Payment Gateway: Facing a problem with the payment gateway is by far the most commonly faced issue. Most of us either use our debit or credit card for making payments online and we quite often face issues in making payments. A session time out error: The heavy traffic on the IRCTC website often results in the users seeing a time out error message while trying to make train bookings. Money getting debited/charged: Quite often than not when trying to make travel bookings the money gets charged to your credit card or gets debited from your bank accounts and you still land up in a catch 22 situation where you still have no bookings against your name which is very frustrating. Pre-holiday/Peak season booking rush: Getting a confirmed ticket prior to the holiday season where everyone wants to travel with their loved ones is no less than a major achievement in your life. 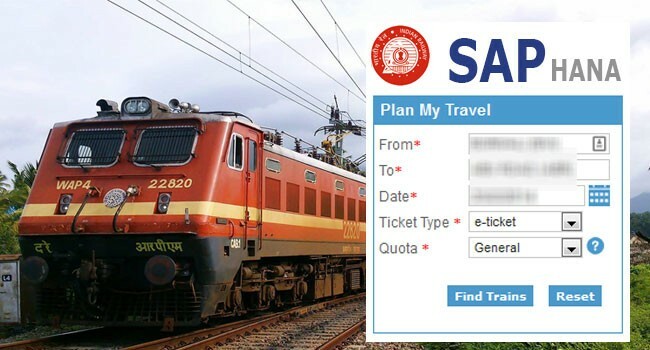 120-day boking period: With the latest additions made to IRCTC, bookings can now be done 120 days well in advance from the date of travel., which makes it all the more challenging for travellers who have to travel in an emergency situation or for those who cannot foresee or plan their travel well in advance. Preference of seats: Most of the travellers like to have a seat of their preference while the senior citizens would prefer the lower berth, which would be comfortable for them, children prefer the window seat generally which makes it quite a cumbersome task for the back end system to allocate seats accordingly and eventually results in backlogs getting created which keep on piling up day in and out. Quota system: The Indian railways has made all provisions to ensure everyone’s safety and comfort. For this, there exists a quota system which are meant for the senior citizens, handicap and even for the ladies. This quota system makes the task of booking tickets all the more cumbrous. What do passengers expect from Indian railways? The general traveller wants the Indian railways to be equipped with the ability to estimate the amount of traffic and accordingly make travel arrangements. The railways also should consider the national holidays and events and make the trains accordingly available. While the railway ministry does a good job in introducing a few summer special train during the summer holiday season, there is still a lot of scope for the improvement. The chances for forecasting in getting a confirmed ticket is very essential and much required, this will enable the passengers in looking out for alternative arrangements rather than simply waiting for the last minute for their ticket to get confirmed in case of a waiting or an RAC ticket. What does Indian Railways require? The Indian railways requires the capability to predict the traffic for them to effectively plan travel and forecast accordingly. The number of cancellations also should be considered while planning travel for various routes. By viewing the information on the link above, we are unable to find out how many cancellations took place on a particular day. This data was later uploaded on the HANA sandbox system for analysis, which will help in analyzing the availability for a particular day or period. How will SAP HANA help Indian Railways? Well, all the challenges with Indian railways will soon be coming to an end as you need not worry anymore. SAP HANA will make life more simple for both the passengers as well as the Indian railways. Session time out error to be resolved: The memory computing capabilities of SAP HANA will equip the application capable of running the most complicated logic in just a few seconds and in a very simple manner, thus negating the time out errors. Estimate Pre-holiday/Peak season booking rush: SAP HANA will enable the Indian railways to analyse the volume of the passenger based on past history and allow the railways in estimated the traffic. On the bases of the information received from SAP HANA the railways will be able to effectively plan additional trains. Confirmed ticket: SAP HANA will also be able to predict the overall chances of getting a confirmed ticket on the basis of the historical data available. Capable of handling large volumes: SAP is quite capable of handling very large volumes and SAP HANA is fully capable of handling an enormous volume of approximately 30 million passengers who travel on a daily basis with the Indian Railways. More than 10000 trains run daily and the data volume for a year will be approximately 10 Billion. Quota system to be managed more effectively: the application SAP HANA should be able to manage the quota system in a much more effective and efficient manner thanks to its computing capabilities. 120-day booking period: SAP HANA will be able to showcase the users about the cancellation along with the bookings so that the user can see how many cancellations take place on a daily basis and make their travel plans accordingly. Effective implementation of Preferential seats : the module can manage the preferential seating arrangement in a much better manner as compared to the current method of the Indian Railways. SAP HANA is certainly planning to resolve all the challenges being faced by the Indian railways and the future looks quite promising too. Read Here for More SAP HANA Tutorials. Why dont seat booking in IRCTC shows the seat arrangement for choose the seat while booking as we do in bus bookings (like red bus or else). The seated arrangement should offcourse restrict the booking on seats reserved for seniors and ladies. what about Tatkal ticket if any emergency can we book ticket online with ought any issue? Indian Railway should manage system like easy and fast process to get tickets by online.